"I believe this nation should commit itself to achieving the goal, before this decade is out, of landing a man on the Moon and returning him safely to the Earth. No single space project. . . will be more exciting, or more impressive to mankind. . . and none will be so difficult or expensive to accomplish." 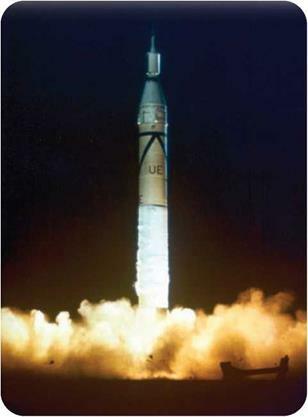 О The United States launched its first satellite, Explorer 1, on a Jupiter rocket at Cape Canaveral, Florida, in January 1958. The Soviets had launched their first satellite a few months before. astronauts on the Moon before the end of the 1960s. NASA successes and failures, broadcast live on television and radio, were very public. Soviet flights were revealed only after a successful launch. The Soviets made more headlines with the first two-person spacecraft, the first woman astronaut, and the first space­walk. With the U. S. Gemini program, however, NASA demonstrated essential space techniques, such as docking. U. S. computer and ground-tracking systems also were far ahead of Soviet electronics at the time. There were human casualties of the space race. Three U. S. astronauts were killed in a fire in January 1967 when they were trapped in their capsule as it caught fire during testing. The men were Apollo 1 crewmen Virgil Grissom, Roger Chaffee, and Edward White. Soviet cosmonaut Vladimir Komarov was killed in Soyuz 1 in April 1967. Three other Soviet cosmonauts (Georgi Dobrovolski, Viktor Patsayev, Vladislav Volkov) died in Soyuz 11, in 1971. By the mid-1960s, manned space­flights attracted huge public interest. The promise of Apollo overshadowed scientific missions by robot probes to the planets Mars and Venus, which were launched by both the Soviet Union and the United States.